I passed by Currie Harbour lighthouse on my way to and from Cape Wickham lighthouse (which we shall see next) on the 29th and 30th July 1987. I took this image on the way back on the 30th. Currie Harbour is above north-western Tasmania, on the western side of King Island. The lighthouse was constructed of iron because the local stone was found to be unsuitable. It was manufactured in England and assembled 0n site. It is 21 metres high and 46 metres above the sea. There were many wrecks along this coast. The lighthouse was built in 1880 after several ships had been wrecked on nearby rocks. 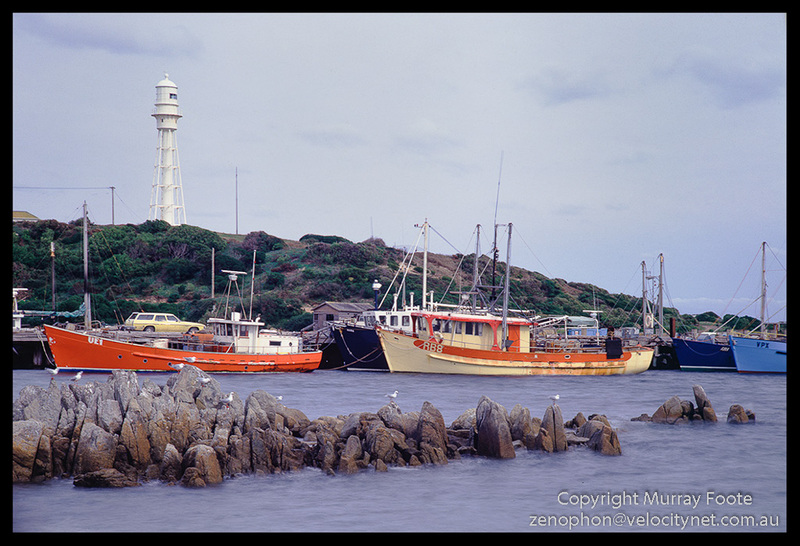 In some cases those ships may have mistaken the Cape Wickham lighthouse on the north end of the island for the lighthouse at Cape Otway further north in Victoria and steered directly for the coast of King Island. This entry was posted in Australia, From Dusk Till Dawn and tagged Architecture, Australia, Currie Harbour, History, Landscape, Lighthouses, Photography, seascape, Tasmania, Travel. Interesting. There is something very modern, almost space-aged, about that iron light house. Beautiful construction. Yes it does contrast with the fishing boats and it’s almost Art Deco. It must have been very different in 1880. It looks so elegant…. when you think of the time it must have taken from the realisation there was need of a lighthouse, to drawing plans and realising it couldn’t be made from local materials, to sending back to Britain, to it being manufactured there…. then shipped back, then erected…. It must have been years and years. We are so used to everything being almost instant it is interesting to reflect on a time when it wasn’t so. MY great-grandfather was born in in Tasmania, so he would have been there when the lighthouse was planned, but emigrated to England before it was completed. Great photo and as ever an interesting text. The building of the lighthouse was recommended by an enquiry in February 1875. It then took until May 1879 or shortly after for the lighthouse to be built and then it wasn’t fired up until March 1880.